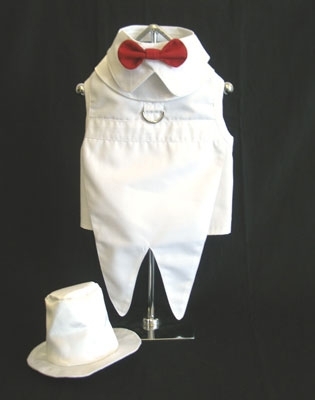 Our all time favorite “High End” White Dog Tuxedo is one of the best white dog tuxedos on the market! Well tailored and fully lined, it features formal tails, a removable Bowtie collar, and Satin cloth Top Hat. The collar has a removable bowtie for easy washing or wearing by itself. Our Tux also features a re-enforced D-ring for safe and easy leash attachment. DOUBLE SIZE and DOUBLE STRENGTH Hook and Loop Closures are GUARANTEED to hold!